Another packed house on Friday night at the Mohawk International Raceway in Akwesasne saw a great show in five divisions. Despite limited experience at MIR Johnathon Ferguson of Prescott dominated the 35 lap Number 1 Speed Equipment Sportsman Series opener, Paul Klager dominated the final 10 laps to win the TUSA Mod Lite Series event, Tim Fuller kept his strong season going with his 2nd straight 358 Modified win while Junior Delormier and Richard Thorton stayed undefeated by claiming wins in Novice Sportsman and Bandit. The Mohawk International Raceway is known in Northern New York for some of the fastest DirtCar races in the north country. Located in Hogansburg, NY and packed full of Family Fun and Action. DirtCar classes that race at this track include; Bandits, Sportsman Modified, Pro Stock, 358 Modified, Big Block Modified, and Go Nuclear Late Models. 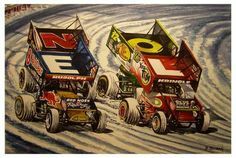 Mohawk International Raceway Would Like To Wish All Of The Fans, Drivers, Sponsors And Employees A Safe And Happy Holidays.